Stop me if you've heard this one: The public is inundated with grand promises of a new market paradigm made possible by the disrupting powers of the Internet. Only thing: The Web interface of this new paradigm turns out to be an unmitigated catastrophe, which is followed in short order by a very public apology along with promises to do what ever it takes to make things right. That's the basic storyline of the federal government's problems with HealthCare.gov, but as it turns out, it's a script that's been almost completely followed by Motorola's borked Moto X Cyber Monday promotion. On Monday, Googlerola offered the public $150 off its flagship Moto X phone via the customizable MotoMaker site. But the site wasn't able to handle the traffic generated by the deal--even those who got in the system were sometimes left unable to complete the action. 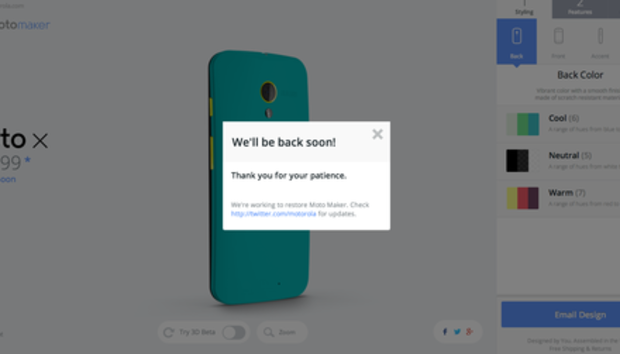 In response to the website problems, Motorola CEO Dennis Woodside offered an apology along with a promise to relaunch the deal on Wednesday, December 3 beginning at noon EST; there will be an additional promotional day on Monday, December 9. (FTR, this is for the regular version only--all tweakable Developer Editions were sold out in the Monday deal). Woodside was able to whip up a response to the digital shortcomings fairly readily. Perhaps this was made possible by taking lessons from President Obama's speech on October 21 in which he vowed to fix and relaunch the problem-plagued Affordable Care website. We know you're frustrated, so are we! Politics and industry can learn a lot from each other in regard to making large scale organizations function. But they can also learn a lot from each other on the occasions when they totally screw things up. #Convergence.